Keyboard Maestro will take your Macintosh experience to a new level. Keyboard Maestro enables you to create or record custom macro shortcuts that you can activate at any time. For example, your macros could help you navigate runnings applications or work with an unlimited number of clipboards. Best of all, every macro you create is available using simple keystrokes you choose. The only limit to Keyboard Maestro is your imagination! Using Keyboard Maestro’s powerful Macros, you can control applications, windows, or menus; insert text; open documents, applications or URLs; execute scripts; control the system, iTunes or QuickTime Player; and more — all with the touch of a key, click of the mouse, periodically or at specific times, when an application is launched or running, or even over the Internet using Keyboard Maestro Control on your iPhone or iPod touch, or by using a web browser to access Keyboard Maestro’s built-in web server. Using Keyboard Maestro’s Application Switcher and Window Switcher you can cycle through applications or windows, closing, hiding, launching, and more. The Application Launcher lets you quickly launch applications. Keyboard Maestro can even help you regain control of your crowded screen by letting you close or hide multiple windows or applications. 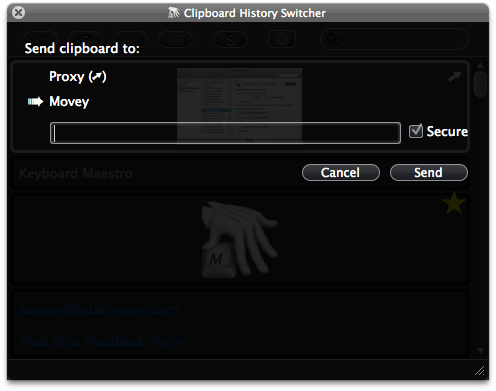 Using Keyboard Maestro’s Clipboard History Switcher, you can access previous clipboards. You'll never lose something on your clipboard again! The Clipboard History Switcher also makes it easy to copy and paste multiple items, such as a username and password or a serial number, without having to switch back and forth between applications for each item. You can mark a clipboard as a favorite so it stays forever or send it to another Mac running Keyboard Maestro. Using Keyboard Maestro’s Clipboard Switcher, you can select from a number of named clipboards, storing information away for later retrieval, or store the details you are working on and access them by name again and again. Keyboard Maestro requires an Intel Mac running Mac OS X 10.6 or later. Keyboard Maestro organizes your macros into Macro Groups. Think of them as folders of macros. Each Macro Group controls when the macros it contains are active. A Macro is made of two parts: a set of Triggers you choose to determine when the macro is executed and a list of Actions that define what the macro does when it is executed. Macro Groups can be activated or deactivated with hot keys, or via the status menu or palette. Macro Groups can display a palette of contained macros. Hot Key - press, hold or release a key. Typed String - type a string of keys. Applications - on launch, quit, activate, deactivate, or periodically while an application is running or active. System Wake - when the system wakes from sleep. Login - when you log in to your Mac. Time - at a particular time of day. While Logged In - periodically while logged in. Macro Palette - with a click on a context sensitive Macro Palette. Status Menu - by selecting from a global system status menu. Public Web - over the Internet, explicitly to the public, or via authenticated log in. Device Key - when any HID device key is pressed, held down or released. MIDI Note - when a MIDI note is pressed or released. iPhone or iPod touch - from your iPhone or iPod touch. By Script - from an AppleScript or a shell script. Switch to Last, Next or a specific application. Bring the current application's windows to the front. Quit All, Other, the current or a specific application. Hide All, Other, the current or a specific application. Show All or a specific application. Manipulate a window - resize, move, center, close, zoom, minimize, bring to front. Move or click the mouse with modifiers. Select a specific menu item. Press a button with a specific name. Simulate moving the scroll wheel. Sleep, Restart, Shut Down, Fast User Switch or Log Out. Increase, decrease, set or mute/unmute the system volume. Increase or decrease the brightness. Play a specific a specific song, a random song or a specific Playlist. Go to the next or previous track. Play or pause the current movie. Increase, decrease or set the volume. Send a MIDI Note or Control Change. Open a file, folder, URL, the current Finder selection or System Preferences pane. Execute an AppleScript or shell script and optionally display or store the results. Insert or Display Text by typing, pasting or with built-in token expansion (e.g., the current time). Simulate Cut, Copy or Paste. Copy, Cut or Paste to/from a permanent Named Clipboard. Set the system clipboard to specific tokenized text, a past copy of the clipboard, or a Named Clipboard. Save the system clipboard to a permanent Named Clipboard. Delete a past clipboard entry from the clipboard history. Filter the contents of the current clipboard. Apply a BBEdit Text Factory to the current clipboard. Search and Replace the current clipboard. Set a variable to specific tokenized text. Set a variable to a calculation. Search and Replace a variable. Use a variable to set the mouse location, adjust window location or size, change the frontmost window or application by name, or set the system volume. Filter variables in a variety of ways. Prompt for variable values (with text, passwords, popup menus and checkboxes). 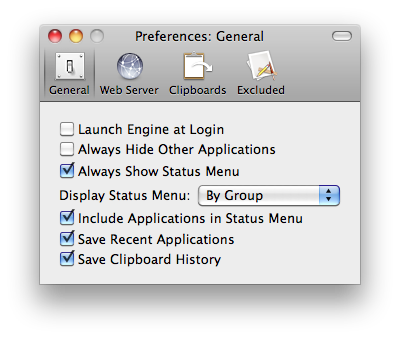 Activate the Application Launcher or the Application, Window, Clipboard or Clipboard History switchers. By speaking text, playing a sound or beeping. Pause for a number of seconds (possibly calculated). Repeat a list of actions N (may be a calculation) times. Cancel All Macros or Cancel This Macro. Record a quick macro without launching Keyboard Maestro. Set (or toggle) whether a Macro Group or Macro is enabled. Show or Hide the Global Macro Palette. Comment (no action, just for helping you document a macro sequence). Display a Cover Flow view of available applications for quick selection. Type ahead selection including abbreviations (eg "a p" for Adobe Photoshop). Copy, Cut or Paste to/from a Named Clipboards using a single keystroke. Keyboard Maestro 5 is a paid upgrade for most users of previous versions. Existing users are eligible for a discount. 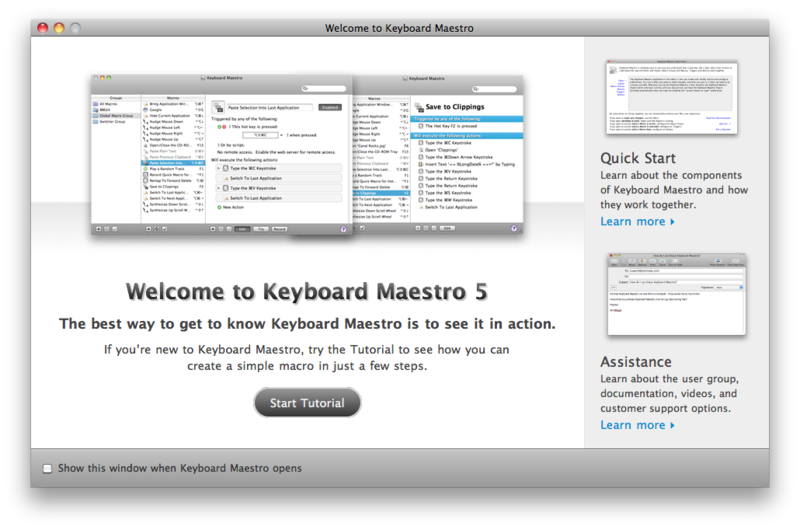 Customers who purchased Keyboard Maestro after 1 March 2011 have been issued a free upgrade to Keyboard Maestro 5. If you have not received your free license, you can find your free license upgrade at http://enquiry.stairways.com/. Customers who purchased Keyboard Maestro prior to March 2011 can upgrade to Keyboard Maestro 5 for US$18 until August 31 2011 and for US$25 after that date. If you have not received your instructions on how to upgrade, you can find details by looking up your Keyboard Maestro license at http://enquiry.stairways.com/. Keyboard Maestro may become available on the Mac App Store at some date, but that is at Apple’s discretion. Please note that Apple does not currently have a mechanism allowing users to transfer a license bought online to or from the Mac App Store version, nor is there any way to receive the discounted price through the Mac App Store when upgrading a previous version of Keyboard Maestro. It is our informal policy to have a paid major upgrade roughly once a year. This allows us to have a reasonably consistent revenue stream with which to fund development of Keyboard Maestro. A fully-functional trial version of Keyboard Maestro is available for downloaded from http://download.stairways.com/. For sales enquires, customer service, technical support, or to contact project management, our current contact information is listed at http://contact.stairways.com/. For more information about anything to do with Keyboard Maestro visit http://www.keyboardmaestro.com/. Here is a quick taste of what Keyboard Maestro offers. To start, launch Keyboard Maestro and it will display the Welcome window. Click the + button under the Macro column to add a macro and display the Macro Editor window. We will now design a complex Macro enabling you to save clippings to a text file. First, launch TextEdit and create a new empty document. Save this blank document as Clippings.rtf in your Documents folder. Got to the Finder, open your Documents folder, then open the Clippings.rtf file. That is all very tedious, and probably explains why most people never even bother! So lets define the whole sequence as a Macro. Save the Macro and now any time you have some text you want to save, just select it and press F2. What used to be too much hassle to bother with is now done in seconds! 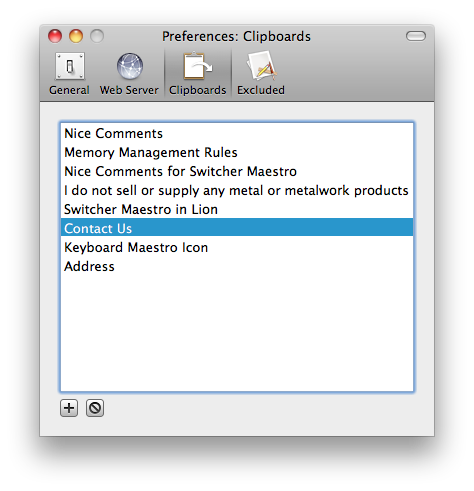 Keyboard Maestro lets you create as many named clipboards as you want using the Clipboards preference pane. If you have a large screen, or a specific job that needs it, you can have the window stay open (by toggling the Close After Action button) and copy or paste named clipboards easily. For less permanent information, Keyboard Maestro automatically remembers your clipboard history, saving a copy of each new clipboard item as you copy it. You can then paste any previous clipboard using the defined Hot Key (by default, Command-Control-Shift-V). Another advantage of the Clipboard History is you can leave the window open (by toggling the Close After Action button) and paste previous clipboards by simply double clicking the desired item. This is particularly helpful when you need to copy many items in many places to be pasted into one application. 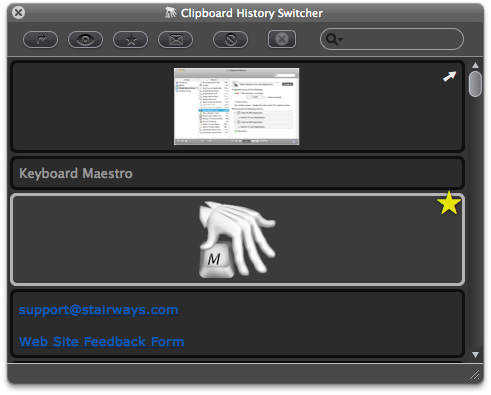 Keyboard Maestro can even save your clipboard history across restarts and log outs. Just enable the “Save Clipboard History” preference in the General preference pane. At the end of the Macro we defined, we used the Switch To Last Application action to switch back to the application you were using before. But most of us use a lot more than one application and we need to be able to switch between them, whether or not the application is already open. You can do more than just switch to between applications with Keyboard Maestro, it lets you define applications that always appear when you are switching so you can launch them quickly, and also Excluded Applications that you never want to see. As well, you can quit, hide or show applications. The Application Switcher is activated like any other macro, so you can find it in the Switcher Group in the Macros window. By triggering the Application Switcher macro (for example, by pressing Option-Tab) you can display the Application Switcher window. As of Keyboard Maestro 5, the default setting is to use Command-Tab to replace the system switcher, but you can change this if you'd like. Primarily Keyboard Maestro is a macro application. A macro consists of a sequence of actions and a set of triggers. When any of the triggers occur, Keyboard Maestro executes the actions. Keyboard Maestro provides a large range of actions that allow you to control applications, type keys, click the mouse, resize windows, control I Tunes, execute scripts and much more. Keyboard Maestro also provides a range of triggers, the most common being the Hot Key trigger, but you can also trigger a macro by typing a string, when an application launches or quits, at a specific time, from a floating macro palette, from your iPhone, via the built-in web server, or using AppleScript. 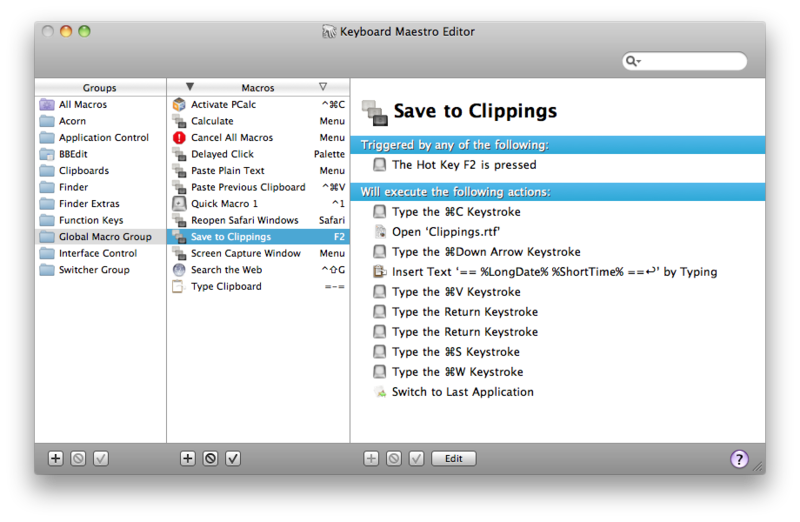 Keyboard Maestro also provides access to a powerful window switcher, application switcher, and clipboard history, allowing you to store and later paste more than just one clipboard, as well as multiple named clipboards. Keyboard Maestro can automate and streamline a wide variety of tasks. Many of Keyboard Maestro’s facilities require access for assistive devices, so you should ensure it is enabled in the Universal Access system preference. Primarily Keyboard Maestro is a macro application. A macro consists of a sequence of actions and a set of triggers. Keyboard Maestro includes a faceless background engine so you only need to launch Keyboard Maestro to make changes. When any of the triggers occur, the Keyboard Maestro Engine executes the actions, even if Keyboard Maestro is not running. So you should ensure the engine is launched when you login. In the General Preferences pane enable the checkbox. You can now quit Keyboard Maestro and the engine will continue to run, so you can execute macros such as the one we setup earlier that opens a document when we press F6. Over the next few days, whenever you find yourself repeating an action, consider launching Keyboard Maestro and creating a macro to automate the task. In this tutorial, we will show you how to create a complex macro that will allow you to save clippings to a text file. First, launch TextEdit and create a new empty file and save it. Next, launch Keyboard Maestro and create and name a new macro. Then add a hot key trigger. Now add the actions. First, copy to the clipboard. Next, open the Clippings file. Record a Command-Down arrow. Insert a header for each entry, including the current date. Paste in the clipboard. Record the keystrokes for Return, Return, Save, Close. And finally switch back to the last application. Quit the editor, and then try it out in the Finder. Adding the current selection to your Clippings file is now as easy as pressing F2. Thanks to Dan Benjamin for doing the fantastic voice overs on these tutorial videos. Download Keyboard Maestro from http://download.stairways.com/. Purchase Keyboard Maestro at http://purchase.stairways.com/. Look up your current or previous license status and serial numbers, and get information about discounted upgrades from http://enquiry.stairways.com/. Join the Keyboard Maestro User Group online community consisting of the developers and Keyboard Maestro users at http://user.keyboardmaestro.com/. Documentation describing Keyboard Maestro is available at http://documentation.keyboardmaestro.com/. The Keyboard Maestro application is the editor. It lets you create and modify macros and configure preferences. You use it only when you want to make changes and then you quit it. It does not always need to be running. Whenever you launch Keyboard Maestro, it also launches the Keyboard Maestro Engine which continues running until you log out (you can have the Keyboard Maestro Engine launched automatically when you login by enabling the “Launch Engine at Login” preference in the General preference pane). Keyboard Maestro organizes your macros into Macro Groups which are like folders of macros. Each Macro Group controls when the macros it contains are active. A Macro Group can target or exclude specific applications, which means the macros it contains will only be active in those desired applications. For example, you can have macros which are active only in Mail.app. A Macro Group can also act as a container for specific-use macros which are enabled only after a Hot Key press or which are displayed as a palette of the macros. For example, you could create a Macro Group containing macros that resized or repositioned windows using the arrow keys, but those macros would only be active after the Hot Key was pressed so that the arrow keys could be used normally at other times. You create a Macro Group by clicking the + button at the bottom of the Macro Groups list. You can disable or enable Macro Groups by clicking the ✓ button. You can configure a Macro Group by selecting it and clicking the Edit button. Keyboard Maestro’s main purpose is to execute Macros. A Macro lives in a Macro Group and consists of a set of Triggers that determine when the macro is executed, together with a list of Actions that define what the macro does when it is executed. You create a Macro by clicking the + button at the bottom of the Macros list. You can disable or enable Macro Groups by clicking the ✓ button. Keep in mind that a Macro can only be active when the Macro Group that contains it is active. You can edit a Macro by selecting it and clicking the Edit button. A Trigger defines when a macro will be executed. There are a variety of Triggers available, the most common is the Hot Key trigger which executes the macro when a specified Hot Key is pressed. Similarly, you can use a typed trigger to execute a macro when you type some text (for example =addr=). Another common trigger is the Macro Palette which lets you trigger a macro by clicking on a context (front application) sensitive floating palette of macros. The Status Menu trigger displays the macro in the Status Menu. You can also trigger a macro when you login or when your Mac wakes from sleep, at a specific time or on a specific day, when an application launches, activates or quits, by executing a script, or remotely using a web browser or iPhone. A Trigger will only execute the macro if the Macro Group and Macro are enabled and currently active. You create Triggers by creating or editing a Macro and clicking the + button at the bottom of the macro detail view. When a Macro is Triggered it executes a list of Actions. Keyboard Maestro performs each of the Actions in order. 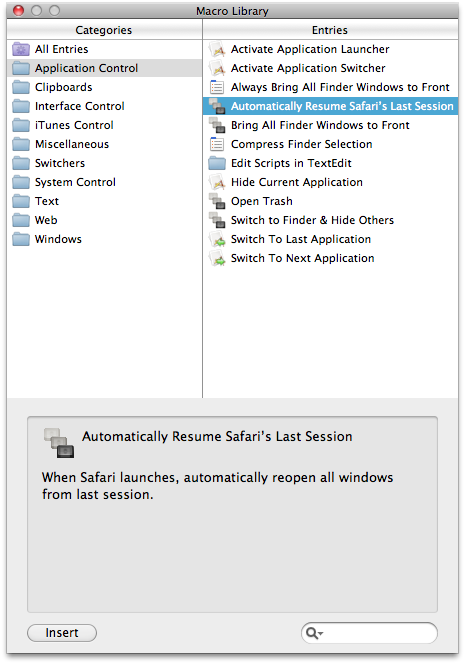 There are a wide variety of Actions allowing you to control applications, simulate user interface events like key presses, mouse clicks and menu selections, open files, control your Mac or the clipboard, or display a variety of powerful switchers (Application, Window, Clipboard and Clipboard History Switchers). You can also execute a script (AppleScript, Shell Script or Automator Workflow). You create Actions by creating or editing a Macro and clicking the + button to display available actions or by clicking on the Record button and performing the action while Keyboard Maestro records your actions to your Macro. By using these six things (Editor and Engine, Macro Groups and Macros, Triggers and Actions) together, you can dramatically enhance your Mac experience. When you launch Keyboard Maestro it launches an invisible “Keyboard Maestro Engine” that continues to run even after you quit Keyboard Maestro. The engine is the process that enables your Macros, Application Switcher, and Clipboard Switcher to work. This means that they will continue to work after you quit Keyboard Maestro, as long as the engine is still running. Keyboard Maestro includes an automatic upgrade mechanism, so to upgrade Keyboard Maestro once you are running version 3.0 or later, simply click the Install Update button when prompted. To upgrade Keyboard Maestro manually, or from any version before 3.0, simply replace the Keyboard Maestro application in your Applications folder with the new one. Because the Keyboard Maestro Engine is probably running, the Finder may not let you replace the existing application with the new version, so the simplest process is to launch the new version (which quits any old engine and starts the new one), then choose Quit Engine command in the File menu and quit Keyboard Maestro. Now move the new version in to the Applications folder, possibly replacing the old one. Finally, launch Keyboard Maestro to restart the engine. 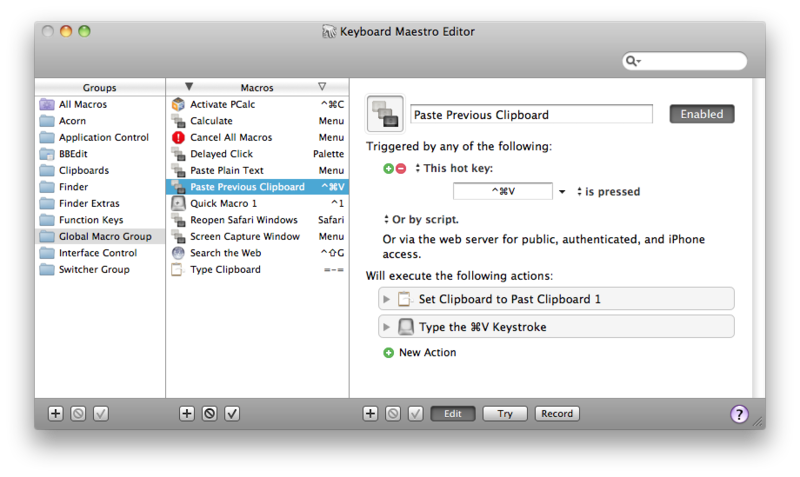 Keyboard Maestro will automatically import your version 3 or 4 macros, clipboards and preferences. Your old macros will be saved in the ~/Library/Preferences/Keyboard Maestro/Keyboard Maestro Macros Saved Version 4.plist in case you decide not to upgrade to version 5 for any reason. If you are upgrading directly from a much older version, you will get better results by upgrading to the last of each major version in turn, ie, run 2.1.3, then 3.5, then 4.3.2, then the current version. If you have not done so already, you should consider turning on the “Launch Engine at Login” preference in the General preference pane to ensure all of Keyboard Maestro’s facilities are available to you as soon as you login or startup your Mac. You can look up your current or previous license status and serial numbers, and get information about discounted upgrades from http://enquiry.stairways.com/. We will submit Keyboard Maestro to the Mac App Store, but when or if it appears there is up to Apple and largely beyond our control. When (or if) it does, you can purchase it as normal from the Mac App Store. If you do not receive your serial number promptly after purchasing, it may be that the email has not reached you, possibly due to spam filtering on your email service. In this case, try looking up your purchase at http://enquiry.stairways.com/ (although that will email you your serial number which might again be lost to over-zealous spam filters). Once you have your username (email address) and serial number, launch Keyboard Maestro and either immediately click the Use Existing License button or choose Register Keyboard Maestro from the Keyboard Maestro menu. Now enter the username (email address) exactly as shown and the serial number exactly as shown and click the OK button. If you have any problems, recheck that the email address and serial number you are entering is exactly as shown (the serial number’s email address does not change even if you have changed your email address with us) and also that your license matches the major version number (eg, a version 5 license will work with version 5.x of Keyboard Maestro). The first thing to do is to read the Quick Start. You may also want to subscribe to our Getting Started emails (Keyboard Maestro will ask you to subscribe). 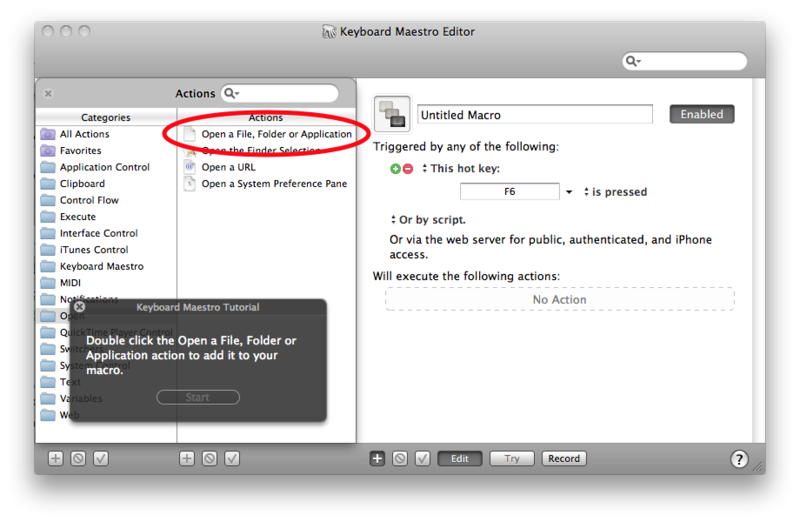 To create a Macro, launch Keyboard Maestro and click the + button under the Macros list. Give the Macro a name, add one or more triggers, and one or more actions. The Macro is immediately active. An easy way to generate macro actions is to turn on recording and proceed to show Keyboard Maestro what you want to do. Then turn recording back off and look through the actions — chances are you will want to delete or adjust some of the recorded actions to make a robust macro, but this will be much quicker than creating each macro manually. You can insert plain text using the Text -> Insert Text action. If you want to insert styled text or images you can do so using a Named Clipboard. Here is how to create a Macro to insert styled text when you press a Hot Key (the same method would work for an image with minor changes). Create a macro (see the How do I create a new Macro? section) with the action Clipboard -> Use Named Clipboard set to Paste from the named clipboard “My Styled Text”. Double check the Activate Switcher macro group contains the Clipboard Switcher Copy macro with Command-Shift-C.
Switch to your word processor and create the styled text if necessary. Then select the styled text and press Command-Shift-C. The Clipboard Switcher window will appear. Double-click the “My Styled Text” entry to copy your selection permanently in to that named clipboard. Now whenever you trigger the macro you just created, your styled text or image will be pasted in. You can create an action Clipboard -> Insert Text which includes tokens. There are some basic date format tokens, or you can use any ICU data format. The Application Switcher (and all the switchers) are activated by macro actions. By default, Keyboard Maestro creates a “Switcher Group” Macro Group, and in there creates six macros. Each macro has a hot key trigger and a matching action which activates the appropriate switcher. For version 2, open the ~/Library/Preferences folder and the folder ~/Library/Preferences/Keyboard Maestro/Saved Version 2 folder. Move the files from the latter folder into the former folder. Trash the ~/Library/Preferences/Keyboard Maestro folder. Download Keyboard Maestro 2.1.3, if necessary, from http://files.stairways.com/keyboardmaestro/keyboardmaestro-213.dmg. Move Keyboard Maestro 2 to the Applications folder and launch it. Turn on the “Launch Engine at Login” preference if desired. For version 3, open the ~/Library/Preferences/Keyboard Maestro folder. Trash the Keyboard Maestro Macros.plist and replace it with the Keyboard Maestro Macros Saved Version 3.plist. Download Keyboard Maestro 3.5, if necessary, from http://files.stairways.com/keyboardmaestro/keyboardmaestro-35.zip. Move Keyboard Maestro 3 to the Applications folder and launch it. Turn on the “Launch Engine at Login” preference if desired. For version 4, open the ~/Library/Preferences/Keyboard Maestro folder. Trash the Keyboard Maestro Macros.plist and replace it with the Keyboard Maestro Macros Saved Version 4.plist. Download Keyboard Maestro 4.3.2, if necessary, from http://files.stairways.com/keyboardmaestro/keyboardmaestro-432.zip. 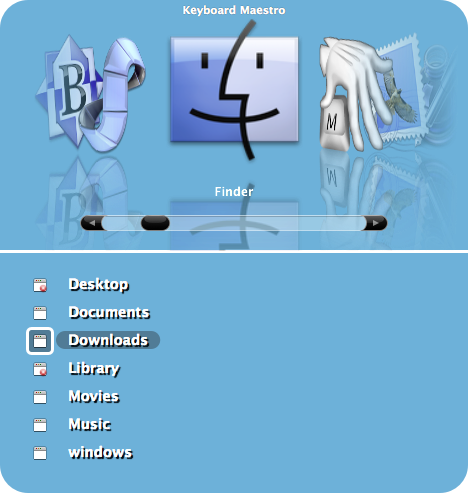 Move Keyboard Maestro 4 to the Applications folder and launch it. Turn on the “Launch Engine at Login” preference if desired. A Macro Group can target or exclude specific applications, which means the macros it contains will only be active in those desired applications. For example, you can have macros which are active only in Mail.app. To have macros active everywhere except specific applications, set the Macro Group to be “Available except in the following applications” and add the desired applications to the list. For example, you could exclude macros from triggering in games. Also, if you have an application that uses lots of function keys for crucial tasks, you could exclude that application to allow you to use the functions keys for macros elsewhere without conflicting with that application. To have macros that are active only immediately after you trigger the Macro Group, set the Macro Group to be activated “Activated for one action when”. The macros in the Macro Group will be enabled when you trigger the Macro Group and will remain enabled until either any macro is triggered or you press any other key. You could use this to create a set of related actions with easily remembered hot keys that will not conflict with normal use because they are not activated until you trigger the group. For example, you could have a group of macros to launch various applications so that Command-Control-L activated the group, and then a single letter press launched the application (eg M for Mail, S for Safari, F for Finder). To have Macros that are active after you trigger the Macro Group, set the Macro Group to be “Activated/deactivated when”. The Macros in the Macro Group will be enabled when you trigger the Macro Group and will remain enabled until you trigger the Macro Group again. You could use this to create a set of related actions with easily remembered hot keys that will not conflict with normal use because they are not activated until you press the group Hot Key. For example, you could have a group of macros to move and resize windows and have Command-Control-W activate the group. Then a single arrow key press moves the front window. When the window is positioned, press Command-Control-W a second time to disable the macros. To have Macros that are active and displayed only immediately after you trigger the Macro Group, set the Macro Group to “Shows a palette for one action when”. The Macros in the Macro Group will be displayed in a floating Macro Palette and enabled when you trigger the Macro Group and will remain displayed until either any macro is triggered or you press any other key. You could use this to create a set of related actions that do not even need a Hot Key. For example, you could have a group of macros to launch various applications like Mail, Safari and the Finder so when you press Command-Control-L, a palette of these macros is displayed and a single click will launch the application. To have Macros that are active and displayed after you trigger the Macro Group, set the Macro Group to “Shows/hides a palette when”. The Macros in the Macro Group will be displayed in a floating Macro Palette and enabled when you trigger the Macro Group and will remain displayed until you trigger the Macro Group again. You could use this to create a set of related actions that do not even need a Hot Key. For example, you could have a group of macros to align objects in a CAD application, so when you press Command-Control-A, a palette of these macros is displayed and you can click various alignment options (distribute left-right, align top edges) and then close the palette by pressing Command-Control-A a second time. To have Macros that are always active and displayed in a palette, set the Macro Group to “Shows a palette until”. The Macros in the Macro Group will be displayed in a floating Macro Palette and enabled. The palette will close when (if) you trigger the Macro Group and will remain closed (and the macros disabled) until you trigger the Macro Group again. You could use this to create a set of related actions that do not even need a Hot Key and that are available in a Macro Palette. You could make the Macro Group available only in a specific application so that it appears only in that application. For example, you could have a group of macros to align objects in a CAD application, and have the Macro Group available (and hence the palette displayed) only in the CAD application. Even if the macros are displayed in a Palette, the macros can still have Hot Key (or any other kind of) triggers which will be available whenever the macro group is active (in this case, whenever the palette is displayed). You can change the targeting of an existing group by selecting it in the Groups list and clicking the Edit button or by double clicking it. editMacro "Macro Group Name or UID"
To delete a Macro Group, select the macro group and then press the Delete key or click the ⃠ button at the bottom of the Groups list. You cannot delete or rename or disable the Global Macro Group - if you want to control when some of the macros within the Global Macro Group are active, make a new macro group and drag those macros to it. Macros, also known as Shortcuts, are a way of improving your productivity by allowing you to more quickly perform repetitive or frequently required actions, tailoring your Mac to your usage patterns. A macro consists of one or more possible Macro Triggers which define when the macro will be executed together with a list of Macro Actions to be performed. Sets of Macros are collected together in to Macro Groups. A typical simple Macro consists of a single Hot Key trigger, such as Control-A together with a single action, such as “type my address” . To create a Macro, first launch Keyboard Maestro, select the desired Macro Group to contain it, and then click the + button below the Macros list. To edit a Macro, double click it, or select it the Edit button. The Macro Editor window will be displayed. You can create a new trigger by clicking on the green ⊕ button. There are several Macro Triggers to choose from, the most common being the Hot Key which allows you to execute the Macro at the press of a key. You can define several different triggers and any of the triggers will execute the Macro Actions. You can delete a trigger by clicking the red ⊖ button. You can add a new action by clicking the New Action button or the + button at the bottom of the macro detail view to display the list of actions. There are many Macro Actions to choose from. The actions you include will be executed in order. You can reorder the actions by dragging them around. You can copy actions by option-dragging. You can also Copy and Paste actions. You can delete an action by selecting it and pressing the Delete key. You can enable or disable actions by selecting them and clicking the ✓ button at the bottom of the macro detail view. An easy way to generate macro actions is to turn on recording by clicking the Record button at the bottom of the macro detail view and proceed to show Keyboard Maestro what you want to do. Then turn recording back off and look through the actions - chances are you will need to delete or adjust some of the recorded actions to make a robust macro, but this will be much quicker than creating each macro action manually. You can display more or less detail about some actions by clicking the disclosure triangle. While disclosed, you can try the action immediately by clicking the Try button at the top right of the action. You can disclose all the actions simultaneously by option clicking on the disclosure triangle. You can try the actions immediately by selecting some or all of them and clicking the Try button at the bottom of the macro detail view. Macros are continuously saved, so the macro is live as soon as it is created. It will be available immediately (subject to the restrictions of the Macro Group it is contained in). You execute a macro’s action sequence by triggering the macro using any of the Macro Triggers you have defined. Note that the web server needs to be separately enabled in the Web Server preference pane, and all macros are subject to the restrictions of the Macro Group they are contained in. See also the Macro Groups, Macro Actions, Macro Triggers and Recording sections. A Macro is executed when any of its Macro Triggers is activated. There are several triggers to choose from (detailed below), the most common being a Hot key, that is a Macro is executed in response to a keystroke, usually in conjunction with one or more modifier keys. You can also trigger a macro by typing a string. Or you can create a floating palette of macros, execute macros in response to applications launching or quitting, execute them remotely via the in-built web server, or at a particular time of day, as well as other possible events. The most common Macro Trigger is the traditional Hot Key. You execute a Macro by pressing a key combination - a keyboard key like a letter, number, symbol or function key, often in combination with one or more modifiers (shift, control, option and/or command). Almost any key can be a trigger, and keep in mind the number pad counts as different keys to the numeric keys on the main keyboard. The macro can execute when the hot key is pressed, released or continuously while it is held down. This allows you to do things like have a macro execute when the key is pressed, and then a second macro execute when the key is released, for example to toggle a setting on and then off again. A common use for Hot Key triggers is to open applications or documents, insert text templates, or as a way of remapping command keys (although you can remap command keys in the System Preferences Keyboard preference settings). If multiple macros are executed with the same hot key, the duplicate macros are displayed in a palette allowing you to select the desired macro. You could use this feature to allow a single hot key to do multiple user-selected actions. Pressing a number key will allow you to execute a macro without using the mouse, or press escape or take any other action to cancel. Typed String triggers allow you to use more verbose (and hence descriptive) sequences of keys to trigger a macro. Because the keys first go through to the current application, the keys are usually deleted prior to executing the macro, although with this disabled you can use it in an application that largely ignores keys. For this reason, the allowed keys in a Typed String macro are limited to plain 7-bit ASCII characters. To avoid macros firing unexpectedly it is a good idea to include a consistent prefix and/or suffix to your strings. For example, to insert your email address, rather than use just “em” (which would fire if you typed “them”, use something like “=em=” which you will not type accidentally. You can optionally allow typed string triggers to work regardless of case, or to remember the case of the typed string and mimic the case in any Insert Text actions. Note that the system will not allow Keyboard Maestro to see keys typed in password fields, so Typed String triggers will not fire if you type them in most password fields - you can use Insert Text by Typing to type in to password fields (although this is a serious security concern), but you cannot use Typed String triggers while inside a password field. You can use the Login trigger to execute a macro when you login. You can have a macro execute when you click on it in a floating Macro Palette. Keyboard Maestro will only display the palette when there are active Macros, so if your Macros are restricted to particular applications, then the Macro Palette will only appear in those applications. This is particularly useful for less frequently used macros whose Hot Key you might forget, or for complex apps like Final Cut Pro that has so many different but frequently used keyboard shortcuts that you cannot memorize them all. You could use a trigger like this to add an action palette to an application that does not have such a facility. You can control the sorting order of macros by adding two characters and a closing braket (eg “01)My Macro”). The prefix will be removed before displaying in the macro palette. You can have a macro execute when you select it from the Keyboard Maestro Status Menu (the Keyboard Maestro icon on the right hand side of the menu bar). You add a macro to the Status Menu by including the Status Menu trigger as a Macro trigger. Keyboard Maestro will only display the Status Menu triggered macros that are active, so if your Macro is restricted to particular applications, then it will only appear in in the Status Menu in those applications. You can control the sorting order of macro groups and macros by adding two characters and a closing braket (eg “01)My Macro”). The prefix will be removed before displaying in the status menu. Keyboard Maestro has an in-built web server. You can enable it in the Web Server preference pane. If enabled, and if you configure a username and password, you can connect to your Keyboard Maestro’s web server and login and then execute any macro you have defined. Also, if the web server is enabled, and if you have configured any Macro with a Public Web trigger, then anyone on the Internet can connect to your Mac and trigger Public Web macros. Macros are only available if they are currently active (ie, they must not be disabled or in a Macro Group that is disabled, and their Macro Group must be currently active which depends on the current application). The macro can be executed when the key is pressed, released or periodically while it is held down. The trigger can also optionally be restricted to when certain modifier keys are pressed. This trigger watches input devices at a low level, but it does not affect them, so any key presses continue to have their normal operation as well as triggering the macro. This is fine for modifiers, unused mouse buttons, programable keyboards and other unused buttons, but would likely be problematic for normal keystrokes which will continue to have some other probably unwanted affect. Keyboard Maestro can be trigger from an AppleScript or shell script. do script "Name or UID of Your Macro"
The macro must be defined and currently active. A Macro executes a sequence of Macro Actions in order. There are many actions to choose from (detailed below), some simple actions, such as Sleep Computer, require no other information and simply do their job, while other more complex actions, such as Select Menu Item, require you to specify more information, such as a target application or menu name. To see all actions, select the All Actions category. To select just your favorite actions, select the Favorites. You can drag actions into your Favorites category. launches if necessary and brings the specified application to the front, optionally reopening the initial windows. If the application is already at the front, the action can optionally switch out, hide or quit it, allowing you to toggle an application, very useful for utilities like PCalc. quits the current application, optionally force quitting or relaunching. set the system clipboard to text. Text Tokens are provided to include such things as the time or date. set the system clipboard to some item that was previously copied to the system clipboard. set the system clipboard to a specified Named Clipboard. 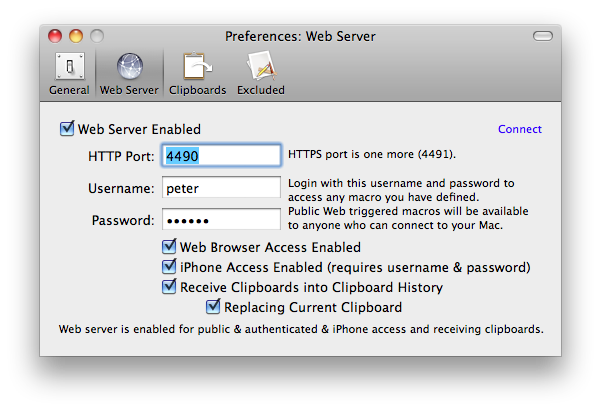 set the specified Named Clipboard to the current system clipboard. apply any saved BBEdit Text Factory to the current system clipboard. apply one of a set of filters on the current system clipboard. search and replace the current system clipboard, optionally using regular expressions, and allowing Text Tokens. The replacement can also include $1 tokens for regular expression replacements. The Filter Clipboard action includes a number of filters you can apply to the clipboard (or correspondingly, the Filter Variable action can apply them to variables). Remove Styles (ie, make the clipboard plain text - not applicable to variables). Capitalize (all words) or Title Case (inteligently uppercase certain first letters). Cancel this macros (including any macro that executed this macro). You will often need to use the Pause action to slow down replaying of an action sequence to allow the system time to catch up—especially after you have changed application or if you want to use a mouse click. There is over a dozen different kinds of conditions, from testing what the current application is, through examining variables or the clipboard, and on to check your network location or testing a pixel on your screen, see the Conditions section. The lines in a clipboard, variable or file. The control flow actions include a nested list of their own actions to execute, and that nested list can include further control flow actions—go wild! But keep in mind, there may be a time when a shell or AppleScript is a more useful way of describing your solution. execute a specified macro. This allows you to create subroutines of instructions. The current macro waits until the submacro finishes. Display it in a floating window. Display it briefly in a HUD window (via Growl if available). Type it in to the current selection. Paste it in to the current selection. Save it in to a variable. For example, you could have a shell script date display briefly in a HUD window every hour, or use a hot key to type the results directly into your text editor. AppleScripts can access variables by talking to the Keyboard Maestro Engine, see the Variables section. Append text to a file from a variable or the clipboard. Screen Capture - capture a window, screen or all screens. Create New Image - with size and color. Flip Image - horizontally or vertically. Rotate Image - by 90°, 180°, 270° or an arbitrary angle. Resize Image - resize image, resize canvas, add or remove margins or crop. Trim Image - trim off transparent areas from the edge of the image. Display Clipboard - display a clipboard image or styled text. Get Image Size - read the image size into a variable. Find Image on Screen - find the location of an image. Image actions typically act on an image in the clipboard or in a named clipboard. You can read or write images files using the File actions. resize, move, center, bring to front, close, zoom, or minimize the front window or a specified window. select a specified menu item in the front or a specified application. The Select Menu Item action lets you choose from all currently running applications and their menus. display a dialog requesting information, see the Variables section. speak text (which may contain Text Tokens) in any desired voice. By default, older versions of Keyboard Maestro used Option-Tab for its Application Switcher to avoid overriding the system Application Switcher, but if you wish to use Command-Tab you can do so. Similarly, if you wish to use the system switcher with Command-Tab, you can do so by changing the hot key trigger or by disabling Keyboard Maestro’s macro. Fast User Switcher to a specific user. starts the screen saver (could be especially useful if the screen saver requires a password to unlock it). The Insert Text action allows you to insert specified text either by setting the system clipboard and pasting, or by simulating a sequence of keystrokes. The Display Text action allows you to display the resulting text in a floating window or briefly in a HUD window (via Growl if available). Tokens are provided to include variables, calculations, the time or date, or a large variety of other system information. The Insert Text action can be very useful to insert standard text templates, such as your signature, address, copyright or other boilerplate text, and so on. If you ever get email from Peter, you will probably notice that many of his emails end with “Thanks for your kind words, Peter.” - with the amount of email he deals with, you don’t think he types that in every time do you? Keyboard Maestro includes permanently stored variables that you can use in a number of special purpose actions, as well as in Calculations or Text Tokens which can be used in almost any field in Keyboard Maestro. set a variable to the result of a calculation, see the Calculations section. apply one of a set of filters to a variable, see the Clipboard section. display a dialog asking for a variety of user input. See below. Which will result in the mouse being placed at the center of the front window. Prompt For User Input will allow you to ask for user input, storing any results in variables as designed. If the variable is a password variable, it will be displayed in a password field. If the popup menu would contain only "0" and "1", then a checkbox is used (so for example “0|1" or "1|0", depending on the desired default). You can include one or more buttons, which may optionally cancel the macro. You can also include / to configure command keys for the buttons (/. means escape, / by itself means the default button). If there are no text fields in the dialog, the command key is not needed and the letter by itself will complete the dialog. The name of the button pressed will be stored in the Result Button variable. This action displays a HUD window where you can enter a search query and then sends the query in your web browser. You can customize the URL (by default the query is to search Google). Record Quick Macro is a variant of this that you can activate at any time without even launching Keyboard Maestro. You trigger the recording, and then perform a series of actions, and then turn off recording. Then press the associated hot key to replay the recording. The Comment action lets you store a comment in your Macro. It does nothing when executed. This can be useful for documenting complex macros. These macros will show or hide the global macro palette. It will remain hidden until shown. You can also hide the global macro palette by clicking the close icon, so you may wish to include a global macro, perhaps with a status bar trigger, which uses the Show Macro Palette to redisplay it. Variable names must start with a letter, and then can contain letters, numbers, spaces, or underscores. Variable names are case insensitive, but their case is remembered. Variable names that starts or ends with “Password” or “PW” are considered passwords - there values will not be stored (except in memory) and they cannot be read by shell or AppleScripts. The Prompt For User Input dialog will display such variables in a password field. Variable values are text, but they can contain comma separated numbers, and can then be accessed as arrays (eg Variable Name). Mouse positions, window frames and the like can then be stored and manipulated in variables. Variables can also be accessed from shell scripts via the environment variables in the form $KMVAR_Variable_Name where KMVAR_ is prefixed, and spaces are converted to underscores. You can also set a variable value to %Delete% to avoid having it show up in variable popup menus. the current date and time in any ICU data format. an offseted date and time in any ICU data format. the name of the n’th application. the position of the n’th window. the size of the n’th window. the frame of the n’th window. the name of the n’th window. Unfortunately, because of this you must use commas for this purpose, and full stops (.) for decimal numbers, regardless of your desired language. Keyboard Maestro’s expressions include precedence, nested bracketed expressions, many inbuilt functions, various numeric bases, so you should be able to write most expressions you might like to use, as well as use it as a general purpose calculator if desired. separates elements of an array. a==b ? 3 : 4.
compare for (in)equality and return 0 or 1.
shift a number left or right. To minimize conflict with variables, operators and functions must be in uppercase. logarithm base 2 or 10.
random real number from 0 to, but not including, N (defaults to 1). random integer number from 0 to, but not including, N.
current time in seconds since the start of 1970.
time in seconds since the start of 1970.
days (and fractions of days) since January 1, 4713 BC Greenwich noon. days since the start of November 17, 1858.
convert time from unix TIME to JULIANDATE. convert time from unix TIME to MJD. convert time from JULIANDATE to MJD. convert time from JULIANDATE to TIME. convert time from MJD to TIME. convert time from MJD to JULIANDATE. get the year component from a unix time (seconds since the start of 1970). get the month component from a unix time. get the day component from a unix time. get the day of the week (1 = Sunday, 7=Saturday) component from a unix time. get the hour component from a unix time. get the minute component from a unix time. get the second component from a unix time. the x coordinate of the current mouse location. the y coordinate of the current mouse location. 1 if the corresponding button is pressed, 0 otherwise. the number of screens (displays). the number of windows in the front application. the number of running applications. the number of (fractional) seconds the Mac has been idle. whether the Mac is currently connected to the Internet. whether the Mac is currently running off battery power. whether the Mac is currently displaying the screen saver (or the display is off). The JD, MJD, and TIME functions return the current date and time, or can take the date (year, month, day) or date and time (year, month, day, hour, minute, seconds) to return. The YEAR, MONTH, DAY, DOW, HOUR, MINUTE, SECOND functions return the relevant component of the current time or the can take the a unix time (seconds since the start of 1970). The SCREEN index can be 0 for the main screen, and then 1 through n are the screens in orientation order. The WINDOW index can be 0 for the main focussed window, and 1 through n are the screens in Z-order (1 is usually the main window), or -1 through -n in reverse order. IDLE time is based on the Human Interface (HID) system, and so notices only HID device activity like mouse movement or keyboard presses, not things like disk access or movies playing. A major feature of Keyboard Maestro is the ability to create macro action sequences by recording your actions. For example, to create a macro that simulates keystrokes, rather than create each macro action individually, you can enable recording and then simply type the keystrokes. There are two ways you can use recording: when creating or editing a macro; or via a Record Quick Macro action. When you are creating or editing a macro, with the Macro Editor window displayed, simply click the Record button to start recording. Then demonstrate the task you would like to perform using any of the above actions and Keyboard Maestro will record your actions as a sequence of Macro Actions. When you are finished, click the Record button again to stop recording. You can stop all recording by clicking on the Recording window. Typically you will need to make a few adjustments to the Macro Actions to ensure the macro will operate robustly when used. For example, you will likely have to switch applications immediately after clicking the Record button, and you may not want that recorded action. Generally, use recording to create a base sequence of actions and then adjust as necessary. You could do this with grep and regular expression, replacing “color (. *)” with “const int k\1 = "\1";”, which is fine if you can remember how to do grep with regular expressions, whether it is \1 or $1, and whether the application you are in supports regular expressions or not. But perhaps a simpler way is to just show Keyboard Maestro how to do the first line and then let it do the others with a single keystroke each. The macro library is a place where we can provide you with a large variety of optional macros. You can download new potential macros from us or from friends or colleagues. You can also share your own macros with out Keyboard Maestro users by exporting your clever macros as a library item. Use Control-Letter and the Insert Text action to type in text for you, such as your name, address, phone number, and so on. Consider restricting these to just the appropriate applications like your Email client or Word Processor by creating a Macro Group for them. Also consider using Typed String triggers for these sorts of macros, for example “=em=” for email address and “=addr=” for address. Rakesh Kumar has created a pack to make life easier for Windows to Mac Switchers. It includes a set of macros for Mail, Microsoft Word and Microsoft PowerPoint as well as macros to map control keys to command keys for various common actions like Cut/Copy/Paste. It also includes a DefaultKeyBinding.dict for Mail to make it work more like Windows users expect. Press “s” to mark (or unmark) an window to be minimize. You can use type-ahead to select a named clipboard, and you can use the search field to filter the clipboards. You can press arrow keys to scroll through the clipboard entries, and return/enter to paste in an entry. configure whether to always hide other applications when switching applications. configure whether to always show the status menu. In the Clipboards preference pane you can add, remove and rename Named Clipboards. You can configure various preferences using defaults write from the Mac OS X Terminal. Some preferences will take effect immediately, but others may require the engine to be relaunched. Note: The Mac App Store engine uses bundle ID com.stairways.keyboardmaestro.editor.engine instead of com.stairways.keyboardmaestro.engine for reasons only Apple can explain. do script "Name of Your Macro"
You can determine a macro’s UID by selecting it and choosing Copy UID command in the Edit menu. You can execute shells scripts, AppleScripts, Automator Workflows, or filter the clipboard using BBEdit Text Factories. AppleScripts and shell scripts give you a powerful way of adding new facilities we have not specifically provided for, as well as controlling other applications. The results of AppleScripts and shell scripts can be displayed, or they can be typed or pasted in to the current selection, or saved into a variable. This allows you to insert text that depends on many factors, such as date calculations, file listings, SQL queries, web pages, or anything else you can imagine. Shell scripts can access variables as environment variables with names like $KMVAR_Variable_Name (KMVAR_ is prefixed, and spaces are converted to underscores). You can delete a Macro Group by selecting it and clicking the ⃠ button below the Groups list. You can delete a Macro by selecting it and clicking the ⃠ button below the Macros list. You can also Copy and Paste actions, as well as drag them around to rearrange them. Use the ⃠ button and ✓ button to delete or enable/disable the selected actions. This window contains examplke and template macros you can add to your macro collection. You can use the macros as is, or edit them to customize them for your particular needs. You can add macros to your library by using the File -> Export as Macro Library and selecting the Add to Library checkbox. You can get Macro Library entries from us or from other Keyboard Maestro users and add them to you library by double clicking them or by choosing Import to Macro Library from the File menu. Remember to use caution when installing a macro or macro library from anyone - macros can potentially do a lot of damage and compromise the security of your Mac, so only install macros from trusted sources. Clicking on this window will stop all recording. This window lets you launcher applications. Select something and select a named clipboard and click the Cut button or Copy button to cut/copy to a named clipboard. Select a named clipboard and click the Paste button button to paste a named clipboard. Click the + button to create a new named clipboard. Select a named clipboard and click the Quick Look button to view it. Select a named clipboard and click the ⃠ button to delete it. 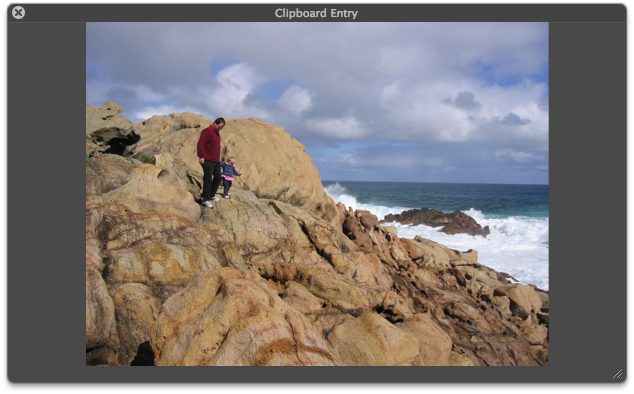 To learn more about the Clipboard Switcher, see the Clipboard Switcher section. Cut or copy something and it will appear in this list. Select an item and click the Paste button button to paste a named clipboard. Select an item and click the ★ button (or press Command-L) to mark it as a favorite, or click the ✉ button (or press Command-S) to send it to another Mac. Select an item and click the ⃠ button to delete it (this is useful if you want to delete a password or other sensitive information). This window pane lets you add, remove and rename Named Clipboards. The Keyboard Maestro menu contains menu items relating to the Keyboard Maestro application as a whole. The About Keyboard Maestro command in the Keyboard Maestro menu displays the About Keyboard Maestro window. The Purchase Keyboard Maestro command in the Keyboard Maestro menu lets you purchase Keyboard Maestro online. The Register Keyboard Maestro command in the Keyboard Maestro menu displays the serial number entry window allowing you to enter your username (email address) and serial number. Make sure you enter them exactly as sent to you. The Check For Update command in the Keyboard Maestro menu checks to see if there are any updates to Keyboard Maestro and offers to download and install them if there are. The Preferences command in the Keyboard Maestro menu displays the Preferences window. The Services command in the Keyboard Maestro menu is used to perform Mac OS X Services which are shared functions available across multiple applications. You can learn more about Mac OS X Services from your Mac OS X documentation, and you can install new services which will work with Keyboard Maestro. Keyboard Maestro includes full support for Services, so relevant Services on your system are available in Keyboard Maestro. The Hide Keyboard Maestro command in the Keyboard Maestro menu will hide the Keyboard Maestro application and all its windows. Click on Keyboard Maestro's Dock icon or choose Show All to show Keyboard Maestro again. The Hide Others command in the Keyboard Maestro menu will hide all other applications. Choose Show All to show them again. The Show All command in the Keyboard Maestro menu will show all hidden applications. The Quit Keyboard Maestro command in the Keyboard Maestro menu will Quit Keyboard Maestro. the Keyboard Maestro Engine will remain running and all enabled Keyboard Maestro features will continue to operate (unless you have specifically quit the Keyboard Maestro Engine). The File menu is where you import or export Macros or launch or quit the Keyboard Maestro Engine. The New Macro Group command in the File menu creates and starts editing a new macro group. The New Macro command in the File menu creates and starts editing a new macro. The Close command in the File menu closes the front window. The Export Macros command in the File menu exports the selected macros to a file that you can import on another Mac. This is one way to transfered macros from one Mac to another. The Export as Macro Library command in the File menu exports the selected macros to a library file that you can share with others. If you create any interesting macros please consider sending them to us and we will make them available on our web site or in a future version of Keyboard Maestro. See also the Macro Library section. The Import Macros command in the File menu lets you select a saved macro file and imports the macros it contains. The Import to Macro Library command in the File menu lets you import a shared macro library file into your macro library. Macros in your library are not active, but can be added into one or more macro groups to become active. The Revert Macros command in the File menu lets you revert to a previous version of your macros. If you find you have really messed up your macros, you can revert to how they were when you first launched Keyboard Maestro, or how they were yesterday or even several days ago. The Launch Engine command in the File menu lets you start the Keyboard Maestro Engine manually. The Keyboard Maestro Engine performs all the Macro, Application Switcher, Window Switcher and Clipboard Switcher functions even while Keyboard Maestro itself is not running. It is launched automatically as a Startup Item when you login (assuming you have not disabled that in the Preferences window) or any time you launch Keyboard Maestro. If it is not running for any reason you can start it manually with this command. This menu item only exists while the Keyboard Maestro Engine is not running. The Quit Engine command in the File menu lets you quit the Keyboard Maestro Engine. The Keyboard Maestro Engine performs all the Macro, Application Switcher, Window Switcher and Clipboard Switcher functions even while Keyboard Maestro itself is not running. It is launched automatically as a Startup Item when you login (assuming you have enabled that in the Preferences window). If you quit the Keyboard Maestro Engine these functions will no longer operate. This menu item only exists while the Keyboard Maestro Engine is running. The Edit menu contains menu items relating to text and selections. The Undo command in the Edit menu undoes the previous command. The Redo command in the Edit menu redoes the previous undone command. The Cut command in the Edit menu copies the current selection to the system clipboard and then deletes the selection. The Copy command in the Edit menu copies the current selection to the system clipboard. The Copy UID command in the Edit menu copies the current selected macro or macro group’s UID. The Paste command in the Edit menu pastes the current system clipboard into the current selection. The Delete command in the Edit menu deletes the current selection. The Select All command in the Edit menu selects all text or items. The Duplicate command in the Edit menu duplicates the selected items. The View menu contains menu items relating to display and actions. The Sort by Macro Name command in the View menu sorts the macros in the main window by name. The Sort by Macro Trigger command in the View menu sorts the macros in the main window by trigger. This is useful to see what hot keys are available, or to group all Typed String triggers together. The Edit command in the View menu toggles Edit mode on and off. Edit mode allows you to modify macros and macro groups. You may prefer to leave it on permanently, or you may like to turn it off when you are not making changes to give a more concise and visually appealing view of the macros and macro groups. The Toggle Enable command in the View menu toggles the enable of the selected items. The Show Actions command in the View menu shows the action list. It is available while editing a macro. Double click or drag actions from the action list to add them to your macro. This menu toggles to Hide Actions when the action list is already showing. The Set Action Time Out command in the View menu sets the time out time and behaviour for the selected actions. You can configure how long an action is allowed to execute for before it is aborted, and whether the macro should continue or be canceled if the action times out. The Try command in the View menu tries the selected actions. It is available while editing a macro. The Record command in the View menu toggles recording on and off. It is available while editing a macro. The Window menu contains menu items relating to windows. The Minimize command in the Window menu minimizes the front window. The Zoom command in the Window menu zooms the front window. The Keyboard Maestro Editor command in the Window menu brings the main Keyboard Maestro macro editing window to the front. The Macro Library command in the Window menu shows or hides the macro library. The Bring All to Front command in the Window menu brings all Keyboard Maestro windows to the front. The Help menu contains menu items relating to Help. The Keyboard Maestro Documentation command in the Help menu displays the Keyboard Maestro documentation. The Keyboard Maestro Quick Start command in the Help menu displays the Keyboard Maestro quick start help, which quickly gets you up to speed in using Keyboard Maestro. The Welcome to Keyboard Maestro command in the Help menu displays the Welcome message, giving you a quick overview of what support resources are available for helping you get started using Keyboard Maestro. The Tutorial command in the Help menu starts the in-application tutorial. The tutorial will walk you through creating a simple macro. By varying the actions slightly, you can create a variety of macros that are triggered by hot keys and that open various documents. The Videos command in the Help menu displays the videos that can help you learn to use Keyboard Maestro. The Logs command in the Help menu displays the Keyboard Maestro Logs folder. The Third Party Licenses command in the Help menu displays the licenses folder containing the third party licenses for code used in Keyboard Maestro. The Online Documentation command in the Help menu takes you to the Keyboard Maestro web site and displays the documentation. The Keyboard Maestro Web Site command in the Help menu takes you to the Keyboard Maestro web site. The Stairways Software Web Site command in the Help menu takes you to the Stairways Software web site. The Service and Support command in the Help menu displays the service and support details. Hot Key Macros are only useful if you can remember which key does what. Consider using mnemonic Macros. For example, in your email client, you might define a set of Macros to Insert Text, so use Control-A for your Address, Control-S for your Signature, Control-N for your Name, and so on. Keyboard Maestro also interoperates with KeyCue - if you use both applications and hold the control key down KeyCue will display all your active Hot Keys. Macros/Switchers do not work after I login, what’s wrong? My Macros are not working, what’s wrong? The Window Switcher shows an empty list, what’s wrong? The Window Switcher shows only some of my windows, what’s wrong? The Application, Window and Clipboard Switcher do not work at all, what’s wrong? I want to use Command-Tab for the Application Switcher? AppleScript’s display dialog does not work, why? I have an X-Key keyboard, are there any issues? The Macros and Switchers were all working fine, but then I restarted or logged out and back in, and now they are not working any more, what’s wrong? The actions are all enabled by the Keyboard Maestro Engine. You can start it by launching the Keyboard Maestro application, or have the engine start automatically by enabling the “Launch Engine at Login” preference in the General preference pane. In order for macros that use actions like Select Menu Item or Manipulate Window to work you must enable access for assistive devices in the Universal Access system preference. Also, check that the macro group that contains the macros is enabled for the application you are testing with. And finally, check that the Keyboard Maestro Engine is running (the Keyboard Maestro icon should be in the menu bar unless you have turned that off or the engine is not running). In order for the Window Switcher to work you must enable access for assistive devices in the Universal Access system preference. The Windows Switcher can only see windows in the current Space, so if you are using Spaces, you will not see windows in another Space. The Hot Keys for the Application, Window, and Clipboard Switcher are all Macros in the Switcher Group, so if you have disabled this group (or restricted it to certain applications), that will affect the switcher macros as well. Also, ensure that the Switcher Group and the macros are enabled. By default, older versions of Keyboard Maestro used Option-Tab for their Application Switcher to avoid overriding the system Application Switcher, but if you wish to use Command-Tab you can do so. Select the Switchers Group, then select the Application Switcher macro. Click the Edit button to switch to Edit mode if necessary. Click the Hot Key field and select your desired hot key, Command-Tab or Option-Tab or any other hot key. See also the Scripting section. In general, Keyboard Maestro’s Device trigger can work with all the P.I. Engineering’s X-Key or other programable keyboards. To use a key, the key must act like a button, that is it must be a single switch that is pressed on/off. You cannot use jogs, shuttles, proportional joysticks or (generally) sliders as trigger buttons. To detect a key, Keyboard Maestro must be able to see an individual key turn on and then turn off. If you are using a double key on your device, you must remove it and configure either of the single keys and then you can replace it - otherwise it will seem like you are pressing two keys and Keyboard Maestro will not know which to use. Currently, Keyboard Maestro cannot recognise the left most column of the MWII Jog & Shuttle, the top two rows of the LCD No Reader, and the left most column of the 128-Key. We are working with P.I. Engineering to resolve these issues. For more information about a specific Keyboard Maestro feature consult the Keyboard Maestro Documentation, post a question to the Keyboard Maestro User Group, visit the Keyboard Maestro web site or contact us. For sales enquires, customer service, technical support, or to contact project management, email us at support@stairways.com or use our Web Site Feedback Form. You can join the Keyboard Maestro User Group online community consisting of the developers and Keyboard Maestro users. For ideas, see the Macro Examples section. You can download Keyboard Maestro from http://download.stairways.com/. You can purchase Keyboard Maestro at http://purchase.stairways.com/. The system clipboard is where you store items when you Copy and Paste. When you Copy an item, it is temporarily stored in the Clipboard and when you Paste, the item is copied from the Clipboard into your currently selection. is a feature of Keyboard Maestro that allows you to copy or paste to/from a set of Named Clipboards. 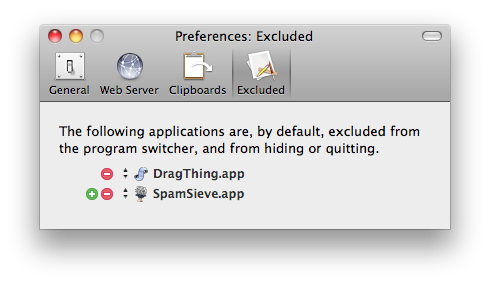 is the set of applications that should not appear in the Application Switcher list, allowing you to hide applications you rarely want to switch to. These applications are also ignored when hiding other applications. a predefined Macro Group that always exists and is the default location for new Macros. A keystroke that acts as a Macro Trigger to start the execution of Macro Actions in a Macro. software from ergonis that displays command keys and can also display Keyboard Maestro Hot Keys (more info). The process that enables your Macros, Application Switcher, Window Switcher, Clipboard Switcher and web server to work even after you quit Keyboard Maestro. Apple’s operating system versions 10.0 and up. Apple’s operating system we’ve all come to know and mostly love. an action you wish to perform, such as opening a file, typing some text, controlling iTunes, and so on. a set of Macros which can be restricted to only a defined set of applications. a floating palette containing any active Macros that have a Macro Palette trigger. The palette only appears in applications with at least once active Macro Palette triggered Macro. an event, such as a Hot Key, application launch, time of day, that starts the execution of a Macro. the original developer of Application Switcher and Keyboard Maestro. Keyboard Maestro provides a set of named clipboards where you can permanently store information (text, logos, graphics, etc). the premier application management utility for Classic Mac OS, written by Michael Kamprath it was in part the inspiration for Keyboard Maestro and forms one of the components of Keyboard Maestro. a macro recorded on the fly in another application. see the Recording section. the action that when triggered records a Quick Macro. see the Recording section. a Shortcut is another name for a Macro (it is also another name for an Alias but that is a different context to the normal Keyboard Maestro Macro context). text tokens allow you to insert dynamic text, such as the current date or time, into various text fields, see the Text Tokens section. a unique identifier that remains the same even if you rename or modify a macro or macro group. an acronym for Uniform Resource Locator, this is the standard way of specifying a location on the Internet. It starts with a protocol, followed by a colon and then the location. For example, “http://www.stairways.com/”. refers to the order of windows from frontmost to furthest back. Keyboard Maestro 5 requires and Intel Mac and Mac OS X 10.6 or later. Development of Keyboard Maestro 4 began in late 2008 and was released in late 2009. Version 4 was a complete rewrite of the user interface, bringing with it a modern look and feel reminiscent of various modern Apple applications. 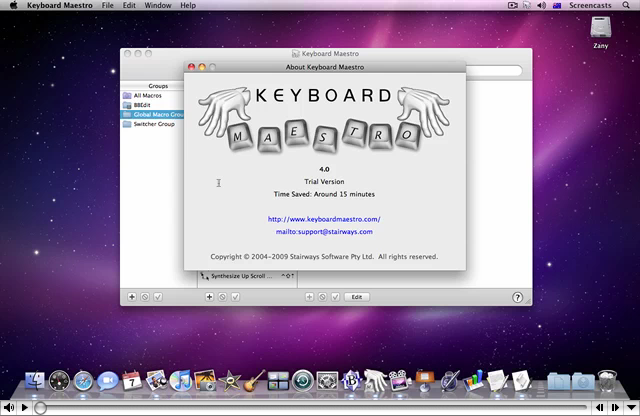 A further either minor releases were made through 2010, followed by the initial release of Keyboard Maestro’s baby brother Switcher Maestro and the Mac App Store version in January 2011. By that point, development of Keyboard Maestro 5 was well under way. Keyboard Maestro 5 built on the solid user interface of version 4 (indeed, the look is almost identical), but added depth and breadth of power with almost no addition of complexity. Keyboard Maestro added such powerful features as control flow, conditions, variables, and calculations as well as many new actions, and enhancements to the application and clipboard history switchers. Thanks to Ken G. Brown for some great beta testing. Matt Gemmell - Magic Aubergine for MGAnimatedView and MGTemplateEngine. Thanks to Corentin, Philippe, Stephen, Brad and others for their great assistance with beta testing. 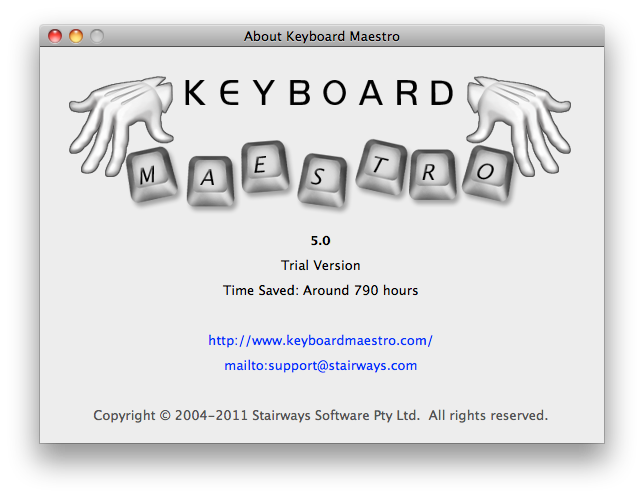 Keyboard Maestro is copyright 2011 Stairways Software Pty Ltd. All Rights Reserved. You may use this application for a short trial period and then you must purchase the application or stop using it. Trademarks owned by Third Parties such as Mac, Mac OS X, and BBEdit, are owned by their respective owners and no license is granted for their use. 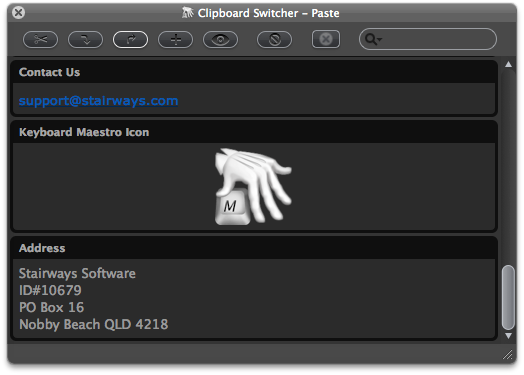 Keyboard Maestro, Switcher Maestro, keyboardmaestro.com, switchermaestro.com and stairways.com are the property of Stairways Software Pty Ltd. Stairways Software Pty Ltd hereby disclaims all warranties relating to this software, whether express or implied, including without limitation any implied warranties of merchantability or fitness for a particular purpose. Stairways Software Pty Ltd will not be liable for any special, incidental, consequential, indirect or similar damages due to loss of data or any other reason, even if Stairways Software Pty Ltd or an agent of theirs has been advised of the possibility of such damages. In no event shall Stairways Software Pty Ltd be liable for any damages, regardless of the form of the claim. The person using the software bears all risk as to the quality and performance of the software.